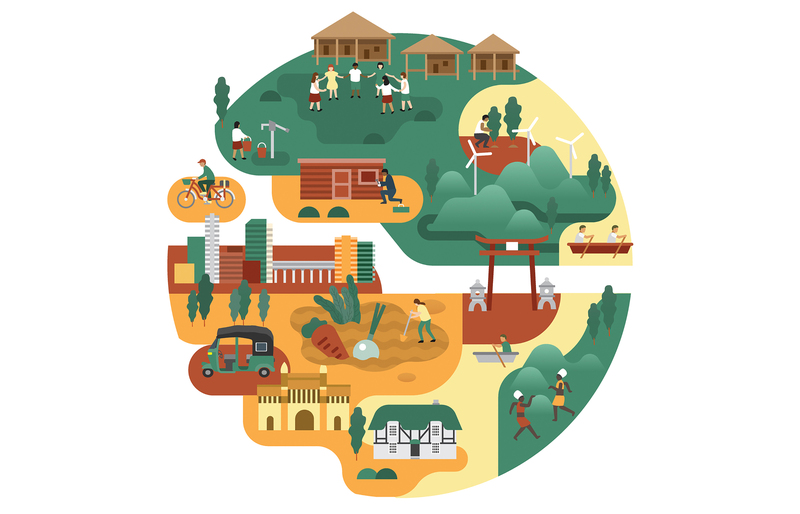 Mobilizing more than 200,000 volunteers across 92 countries, the Rotary Community Corps expands Rotary’s reach by bringing the knowledge and talents of local people to projects in their communities. Sponsored by a local club, corps members are not Rotarians but can tap into the Rotary network. Conceived as the Rotary Village Corps during the term of RI President M.A.T. Caparas in the late 1980s, the Rotary Community Corps (RCC) was initially viewed as a program for the developing world. Even today, most of the 9,400 RCCs are concentrated in India, followed by the Philippines and Africa. About 60 are sponsored by clubs in the United States; Canada hosts four. Every community corps differs in size and scope. Meet four of them. In 2010, rains thrashed Colombia, flooding nearly 4,000 square miles of farmland and coastal villages – including Leticia, an impoverished community reliant on the shrimp harvest. The Cartagena Rotarians wanted to help revitalize Leticia. But the journey there was difficult – a 45-minute drive from Cartagena, followed by another 45 minutes aboard a motorboat. “This community doesn’t receive a lot of assistance because it’s so far away,” says Barrios. To bolster the relationship, the Rotarians recruited residents for a Rotary Community Corps. One thing the village struggles with is adequate sanitation. “We asked them for their solutions,” says Barrios. Asking people from the community to do their own assessment and come forward with solutions to problems is a core principle of RCCs. After putting together a needs assessment, the Leticia RCC members worked with districts 4271 (Colombia) and 5280 (California) and the Rotary clubs of Los Angeles and Woodland Hills, Calif., on a $38,000 global grant to install a basic sanitation system that included 25 septic tanks and 25 bathrooms, each including a toilet, shower, and sink. Members of the RCC monitor the system to ensure that it is working properly. Using other funding, the corps also beautified a church that serves as a community hub, equipping a small room with computers, improving a playground, and planting trees. New friendships have developed. We have music, we have dances, we eat together. The RCC members consider us part of the family. It’s also been important for our growth as a club. In 2015, the high school that serves Leticia and the nearby village of El Recreo faced closure. Members of the Rotary club encouraged the women in the RCC to go to the municipal offices and advocate for their rights. The appeal spared the school and brought a new Rotarian into the Cartagena de Indias club – the local secretary of education, Clara Inés Sagre Hernández – and resulted in a new RCC in El Recreo. In 2011, when Jerry Olson was president of the Rotary Club of Metro Roxas, Philippines, some members suggested investigating how the club could bring clean water to Ameligan, a remote ward, or barangay, on the island of Panay. Olson, now chair of the District 3850 (Philippines) Rotary Community Corps Committee, says the club applied for a Rotary Foundation grant, enlisting the Rotary Club of Pomona, Calif., and District 5300 (California) as international partners. **“We did our homework on how to make the project sustainable,” Olson says – one that would be managed by local people in a new RCC and would provide potable water, helping prevent waterborne diseases and allowing hundreds of children to spend time in school instead of fetching water by ferry from across the river. Anchored to withstand the tidal currents of the Panay River, a 5-kilometer line now conveys fresh water to 60 households in the barangay. The line was laid by hand by RCC members and a dozen Rotarians. “As a club, we went to Ameligan with professional trainers to teach the residents how to manage their RCC and the water project,” Olson says. “By March 2012, we had laid the piping and built five water stations.” A sixth has since been added. About 10 members of RCC Genesis Ameligan maintain and administer the water system, collecting payments from the owners of homes linked to the line, as well as from individuals who buy water by the can. For Rotary clubs thinking of starting an RCC, Olson says it’s important for the prospective members to take ownership and to understand that their RCC is for them. Training corps members, particularly when complex projects such as water systems are involved, is key, says Olson, who adds that continuing oversight by the Rotary club helps ensure sustainability. In Ameligan, Olson notes, “The RCC improved the water system by expanding it to more areas on the island that before had never had a clean source of water.” RCC members also plan to use a surplus of $1,200 toward improvements. Once they leave the public education system, people with developmental disabilities in the United States often lose their social support system and opportunities for friendship and personal development, says Kam Breitenbach, a member of the Rotary Club of Parker, Colo.
**“When they turn 21, the school district is done,” says Breitenbach, a longtime Special Olympics basketball coach who was a special education assistant while her children were growing up. “There’s no place for them to learn or do any leadership activities.” So in 2010, she asked her club’s board of directors to consider starting an RCC for adults with developmental disabilities. “They said, ‘We’ll try it for six months, and then we’ll review it,’” Breitenbach says. Seven years later, the Parker Rotary Community Corps is still going strong. More than 50 members with varying ability levels participate in service projects and hold meetings patterned after Rotary club meetings. “We never had that review,” she notes. The Parker RCC’s projects range from putting on homecoming dances and proms to stuffing backpacks for needy schoolchildren and filling grocery bags for a local food pantry. In December, the corps members were busy organizing a holiday breakfast at a local senior center and putting the finishing touches on 100 fleece blankets intended for facilities including a local hospital. Expecting success from people with special needs yields dividends in self-confidence, notes Breitenbach. “When we first started we had a member, Doug, say he would not run for office in the RCC because he didn’t want to be put on the spot,” she says. The RCC had a ShelterBox display at a community event called the Parker Days Festival, and Breitenbach urged people to ask the corps members about the exhibit. “Doug said that changed his life, because he found he could talk to people and they would listen.” He has been the RCC’s sergeant-at-arms for four years. In the United Kingdom, induction (or hearing) loops help broadcast sounds for people with hearing loss by generating a magnetic field that is picked up by hearing aids and cochlear implants to lessen background noise and bring conversation to the forefront. Under the Equality Act 2010, such loops should be installed in most public buildings, including libraries and council offices. But without anyone trained to activate them, many of the audio-frequency systems (which are based on World War II technology developed by the Royal Navy to detect enemy submarines) remain idle. Heeding the call of member Dave King, who worked with a nonprofit focused on hearing loss, the E-Club of West of England started a Rotary Community Corps in the town of Swindon to address the problem. Tim Mason of the Rotary Club of Cosham, who had started Britain’s first RCC in nearby Malmesbury, formed a steering committee that included the borough councilor and officials from a local hospital and an international insurance company. They recruited 15 people, including two Rotarians. By December 2016, two-person teams from the Let’s Hear in Swindon RCC had checked more than 500 loops around the town. “With Let’s Hear, there was a groundswell of people who wanted to improve the situation” for the hearing impaired, and community groups across the country have begun to replicate the project, says Anthony Horn, past governor of District 1100 and a member of the Rotary Club of Swindon Phoenix. While England is a latecomer to adopting the RCC model, Horn and Mason see promise for hands-on, technical projects. Members of the RCC in Malmesbury focus on flood control, monitoring the water level of the Avon River, and checking that sluice gates remain free of debris. Want to join or start an RCC?